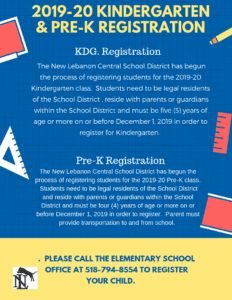 The New Lebanon Central School District has begun the process of registering students for the 2019-20 Kindergarten class. Students need to be legal residents of the School District and reside with parents or guardians within the School District and must be five (5) years of age or more on or before December 1, 2019 in order to register for Kindergarten. Please call the elementary school office at 518-794-8554 to ensure your child is on the registration list. The New Lebanon Central School District has begun the process of registering students for the 2019-20 Pre-K class. Students need to be legal residents of the School District and reside with parents or guardians within the School District and must be four (4) years of age or more on or before December 1, 2019 in order to register. Parent must provide transportation to and from school. Please call the elementary school office at 518-794-8554 to register your child.